It's time I introduce the sixth, and at this time, final member of our family. This person is Alex's favorite and her name is Lucy. Perhaps person is not how the rest of the world would see her - but Alex does. 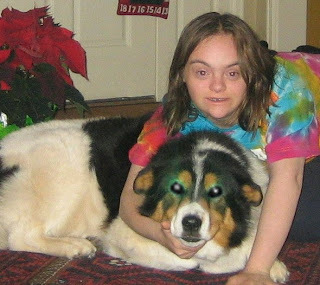 Lucy is a seventy pound, eight year old, half bernese, half akita dog. I know that Lucy is Alex's favorite because she shares that with me - very often. When Alex is mad at me, she tells Lucy that she is the only one in our family that she loves. Not so sweet for me, but this is a way for Alex to vent and all part of the parenting thing. When Alex was born we had two older dogs that have since passed away. Boomer and Ski were great dogs - but since we got them pre-kids, they were fairly old when the kids were born. Alex remembers them, although it was a least eight years ago. When she senses I am sad about something (usually after a "discussion" with her) she will ask me if I miss Boomer and Ski. Then she will reassure me that they are fine and hanging out with my Dad in heaven. Funny how her mind works. She pulls things out at the strangest times. Wish I figure out what cued her - perhaps a PhD dissertation is in my future. We took a few years off from family pets, except for the usual gold fish, salamanders and guinea pigs. When Alex was 11 we decided we should get a real family pet - one that might live longer than a couple of months. Part of this rationale was to help Alex overcome her fear of all dogs, and especially barking dogs. Every time we went for a walk or visited friends, and dogs were involved, Alex would have a panic attack - and we did not know how to help her. We went to the local shelter and met a number of likely candidates. Alex was very timid around the dogs - so the people at the shelter recommended we come back the next weekend. We did return and we were introduced to Angel (nee Lucy). We called her Lucy, as we liked the name better, and she took an immediate liking to Alex. Much to our surprise it was reciprocated without hesitation. We knew she was the right friend for us - and home she came. Lucy and Alex are very close. I go back to my observation about horses and children with special needs. There is something there that I can not see- an understanding that an animal has with our special kids - a bond that I can not duplicate in any other way with my daughter. There is not a day that goes by that Alex does not hug Lucy, call her sweetheart, and tell her that she loves her. I believe that Lucy helps Alex feel important. Lucy does not boss her around. Lucy has no preconceived expectations of what Alex can or can not do. Lucy is always by Alex's side. It is unconditional love. Lucy is a true and loyal friend. It really is a bit of magic.